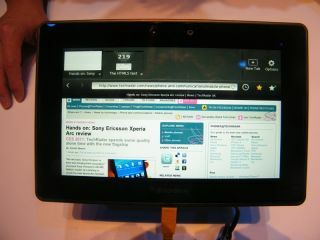 Tablet computers won't impact on the global demand for smartphones, Norm Lo, RIM's VP of Asia Pacific, has said. Despite major overlaps in functionality, tablets like the iPad and BlackBerry Playbook won't stem the public's desire for all-singing, all-dancing mobile phone handsets. "However, impact may exist on sales of notebooks and netbooks," said Lo. Which is all good news for RIM, maker of both BlackBerry smartphones, a BlackBerry tablet and absolutely no notebooks or netbooks. Rather than a competitor, BlackBerry-maker RIM sees the tablet as a complementary device to the smartphone, with larger screens and greater power enhancing the smartphone experience. Detractors have suggested that the tablet is an unnecessary middle-man device, offering few new benefits over notebooks or smartphones other than being delivered in sleek new packaging. Tech manufacturers obviously disagree, with vast numbers of new tablet devices being unveiled at this year's Consumer Electronics Show and excitement for Apple's next iPad unabated.